"If you try to chase trends and jump on the bandwagon, people will see right through you," says Jacob Bunton, lead singer, guitarist and songwriter for the Birmingham, Alabama-based trio Lynam. "You can't sound like the Sunset Strip one minute and Rage Against The Machine the next," he adds. 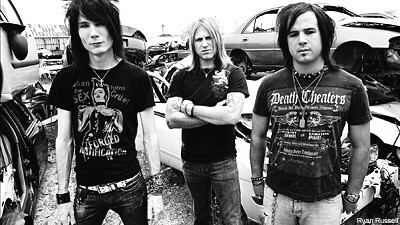 Lynam formed in 2001 out of the ashes of Mars Electric and brand themselves as a modern outfit with a tendency toward arena rock. Warning: there are guitar solos here! "A good song is a good song. Big rock is what we're all about. That's what we strive to achieve," affirms Bunton. Big rock indeed. Among their many influences, Lynam cite Mötley Crüe and Def Leppard at the very top of the pack. The band recorded with Tom Keifer of Cinderella and shared the stage with the likes of Poison and Ratt. Make no mistake: Lynam like the rock star look and go in for stores that sell band t-shirts. You know, like Hot Topic. "I love it when I see kids wearing the old school shirts" admits Bunton. "I love it even more when I see a kid wearing the shirt and they actually love the band. I've met a lot of kids that know deep cuts from Iron Maiden and Mötley Crüe."